The 2019 Application Period Has Ended! In support of the ideals of the Worldwide Scouting Movement and in order to promote wilderness camping experiences, Troop 160 Memorial Scout Camp has established the MSC Campership Program. This program makes camperships available to any scout upon the recommendation of his / her scout group leader. At this time, we have established three memorial camperships to be awarded annually. Camperships are available for any long-term camping experience that will occur during the 2018 calendar year. Craig Goodwin was a member of Boy Scout Troop 160 of Lewiston, Maine from 1981 until his death in 1984. Craig was a scout who came from a single parent home of modest means. Although he and his mother did not have much money, they were always willing and able to work hard to insure that Craig did not miss out on any scouting activities. It is only fitting that the Craig Goodwin Campership be awarded to a scout who has limited financial means, but shows willingness to work hard to pay his or her own way within their scout group. 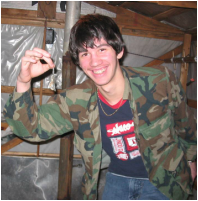 Adam Beggs was a member of Boy Scout Troop 160 of Lewiston, Maine from 2002 until his death in 2007. Adam will always be remembered as a scout who truly exemplified the fourth point of the Scout Law: A SCOUT IS A FRIEND TO ALL AND A BROTHER TO EVERY OTHER SCOUT, NO MATTER TO WHAT SOCIAL CLASS THE OTHER BELONGS. It is only fitting that the Adam Beggs Campership be awarded to a scout who exemplifies the same spirit of friendliness, as recommended by the leader of his or her scout group. Joe Beggs was a scout as a boy and an avid outdoorsman as an adult. His greatest joy in life was spending time at his camp on Spectacle Pond in Osborn, Maine. In 2011, Joe offered his camp in order to establish the Memorial Scout Camp at Spectacle Pond. On July 10, 2013, Joe Beggs passed away unexpectedly at his home. It is only fitting that the Joe Beggs Campership be awarded to a scout who is recommended by the leader of his / her scout group for being a true outdoorsman. In addition to participating in outdoor sports and camping, the candidate should have a background in nature-ecology and must be conservation minded. ﻿﻿﻿Under no circumstances should a scout be recommended by his or her parent. ​If you have further questions, click here to go to our FAQ.